Shirts With Random Triangles: 4-Star Safety Prospect Grant Delpit Commits To LSU's 2017 Recruiting Class. 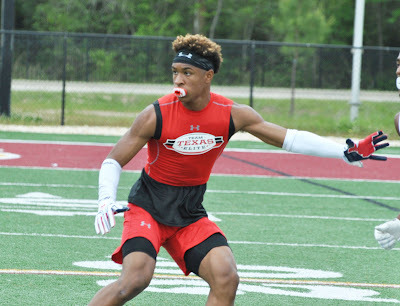 4-Star Safety Prospect Grant Delpit Commits To LSU's 2017 Recruiting Class. Grant Delpit. Image via nola.com. LSU has added a four-star fifteenth commitment to its 2017 recruiting class. Bradenton, Florida high school rising senior safety Grant Delpit committed to the Tigers Saturday evening. Delpit made his announcement while attending Nike's The Opening Finals event in Beaverton, Oregon. 247Sports.com grades Delpit as a composite four-star safety prospect. The recruiting website ranks Delpit at no. 9 among 2017 safety prospects, at no. 20 among 2017 prospects from the state of Florida, and at no. 92 in its composite national overall rankings for 2017 prospects. Originally a Louisiana native, Delpit attended Lamar High School in Houston, Texas last season. He will be attending IMG Academy in Bradenton, Fl. for his senior high school year. Delpit stands 6'3.5, and weighs 181 lbs.